A short word on the Nike Powerwall. 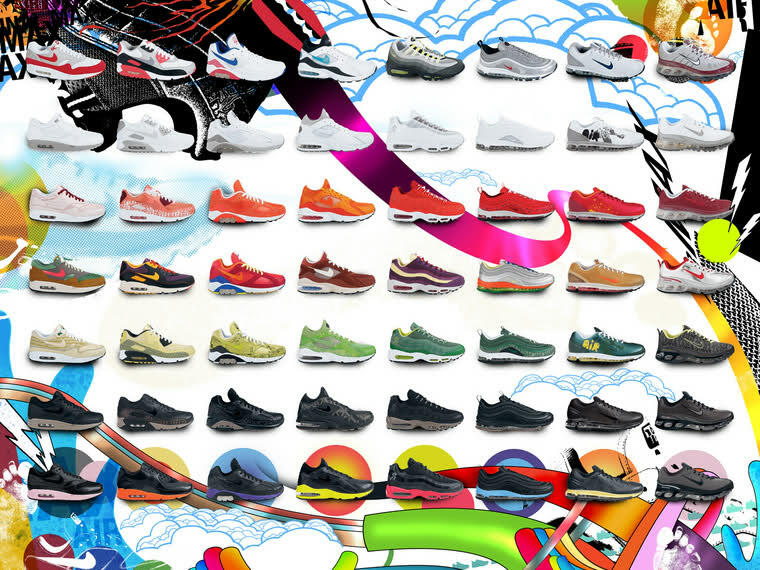 To celebrate 30 years of Air Max, Nike brought out the ‘Powerwall’ in 2005. The old Air Maxes in their original materials and colors (although I think not every model is at its best, the 90 has worse colors than its successors). Theme was white with grey accents. All from a light red (‘pink’) to a darker red. 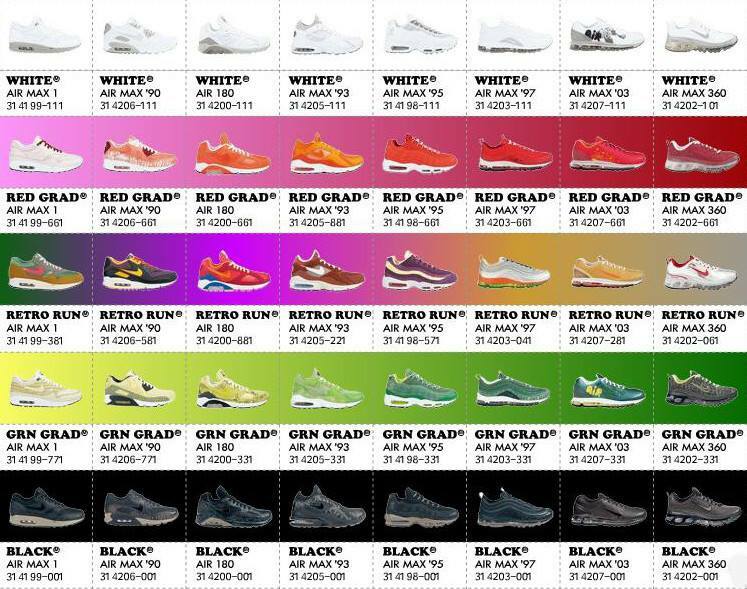 They use colors of old models which were around when Nike started as Blue Ribbon Sports in the 1970s. All from a light green (‘lemonade’) to a darker green. Theme was black with brown accents. The rarest of them all. I think 144 pairs per model. They were inspired by japanese toys, including the ‘morning glory’. The pic doesn’t show all of the models as there were the “Celebration Pack” as well as womens’ versions. Why you see only some of them is also the nature of many shoes: Many are just bought to be kept at home unworn, others are worn until they are destroyed. 10 years after the release you don’t see many unpopular, unworn models. And even if they are not one of the more hyped models, pricing them high always seems a bit ridiculous to me. When you can’t understand why, you don’t know the quality Nike used to produce. If they would make good stuff now, old people wouldn’t miss the old days. But why are they making worse stuff now? Easy, as the models became less performance models and more lifestyle models, the demands declined too. So why should they make them as good? It is really understandable for one of the biggest brands worldwide that they only make what is required of them. Lifestyle demands are much lower than performance, think of the strain a days walk in the city puts on a shoe compared to an hour of running.